Better known as aspirin, salicylic acid is an over-the-counter drug used to manage various types of pain in humans. Like other non-steroidal anti-inflammatory substances, this chemical can be deadly to dogs. While aspirin is prescribed to some dogs in small doses, pet owners should never give their pup this medicine without consulting with a medical professional first. Salicylic acid usually is pressed into tablet form and distributed by the bottle, although it also can take the form of a topical ointment. One of the advantages of aspirin is its fast absorption rate through the digestive tract, with effects that begin within 30 minutes to 3 hours in dogs, according to The Merck Veterinary Manual. Unfortunately, this also means that the impact of a toxic overdose can start in less than an hour after ingestion. This leaves pet owners with little time to spare when seeking emergency treatment for a poisoned animal. The symptoms of aspirin toxicity are often recognizable, but difficult to diagnose accurately without medical training and specialized equipment. A disinterest in food is often the first sign of poisoning in dogs. It may go unnoticed until more severe signs emerge, according to Waccamaw Regional Veterinary Center in Conway, South Carolina. Salicylic acid soaks through your dog's stomach and intestines, so an overdose can damage the sensitive lining and cause internal bleeding. This may disrupt your pet's digestive processes, causing vomiting or diarrhea. The chemical can spread throughout your dog's body quickly, causing breathing problems and muscle weakness. Seizures, tremors and other alarming symptoms also can occur in the hours after an overdose. If you believe your dog has swallowed aspirin meant for human consumption, or if he may have overdosed on prescription medicine, take him to an emergency clinic immediately. Every second counts when it comes to expunging pharmaceutical toxins. Your vet may use a stomach pump or administer substances to induce vomiting to rid your dog of any undigested pills remaining in his stomach. 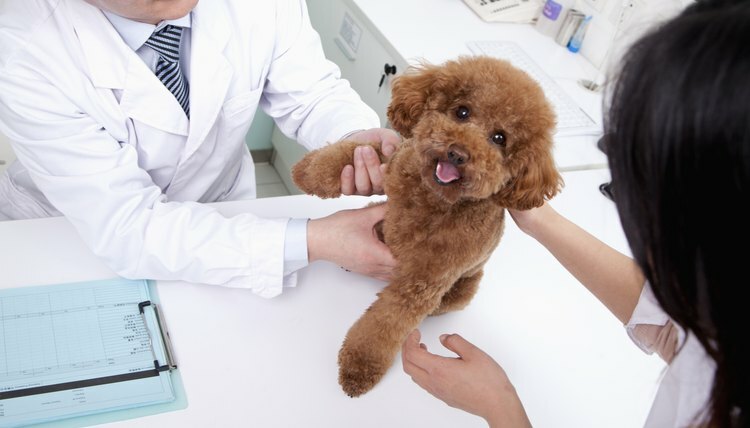 He may use fluid therapy to reduce the concentration of the toxin in your dog's bloodstream to mitigate the ongoing effects and relieve the impact on internal organs. Preventing aspiring poisoning is preferable to treatment, for you and your dog alike. Keep all medicine bottles, even over-the-counter treatments, away from both pets and children. Childproof lids aren't necessarily teeth-proof, so don't give your dog a chance to chew through the bottle when you are out of the house. Only give your pet aspirin that is prescribed by a veterinarian. Pay close attention to the labels before administering medication to pets or family members.